This article is about Nordic ships of the Viking age. For ships named "Viking", see Viking (disambiguation). For other uses, see Viking Ships (disambiguation). A modern replica of a Viking ship. This ship is of the snekkja longship type. The ship has been functioning as the centerpiece of Scandinavian culture for millennia, serving both pragmatic and religious purposes, and its importance was already deeply rooted in the Scandinavian culture when the Viking Age began. Scandinavia is a region with relatively high inland mountain ranges, dense forests and easy access to the sea with many natural ports. Consequently, trade routes were primarily operated via shipping, as inland travel was both more hazardous and cumbersome. Many stone engravings from the Nordic Stone Age and in particular the Nordic Bronze Age, depict ships in various situations and valuable ships were sacrificed as part of ceremonial votive offerings since at least the Nordic Iron Age, as evidenced by the Hjortspring and Nydam boats. The Viking kingdoms developed into coastal towns and forts, all of which were deeply dependent on the North Sea and the Baltic Sea for survival and development. Control of the waterways was of critical importance, and consequently advanced war ships were in high demand. But in fact, because of their overwhelming importance, ships became a mainstay of the Viking religion, as they evolved into symbols of power and prowess. Throughout the first millennium, respectable Viking chieftains and their relatives were commonly buried with an intact, luxurious ship to transport them in the afterlife. Furthermore, the Hedeby coins, among the earliest known Danish currency, have ships as emblems, showing the importance of naval vessels in the area. Through such cultural and practical significance, the Viking ship progressed into the most powerful, advanced naval vessel in Viking Age Europe. Knarr is the Norse term for ships that were built for Atlantic voyages. They were cargo ships averaging a length of about 54 feet (16 m), a beam of 15 feet (4.6 m), and a hull capable of carrying up to 122 tons. Overall displacement: 50 tons. This is shorter than the Gokstad type of longships, but knarrs are sturdier by design and they depended mostly on sail-power, only putting oars to use as auxiliaries, if there was no wind on the open water. Because of this, the knarr was used for longer voyages, ocean going transports and more hazardous trips than the Gokstad type. It was capable of sailing 75 miles (121 km) in one day, held a crew of about 20–30, and knarrs routinely crossed the North Atlantic in the Viking Age, carrying livestock and goods to and from Greenland and the North Atlantic islands. The design of the knarr later influenced the design of the cog, used in the Baltic Sea by the Hanseatic League. The Gokstad ship, on display at the Viking Ship Museum in Oslo, Norway. With such technological improvements, the Vikings began to make more and more ocean voyages, as their ships were more seaworthy. However, in order to sail in ocean waters, the Vikings needed to develop methods of relatively precise navigation. Most commonly, a ship's pilot drew on traditional knowledge to guide the ship's path. Essentially, the Vikings simply used prior familiarity with tides, sailing times, and landmarks in order to route courses. For example, scholars contend that the sighting of a whale allowed the Vikings to determine the direction of a ship. Because whales feed in highly nutritious waters, commonly found in regions where landmasses have pushed deep-water currents towards shallower areas, the sighting of a whale functioned as a signal that land was near. On the other hand, some academics have proposed that the Vikings also developed more advanced aids to navigation, such as the use of a sun compass. A wooden half-disc found on the shores of Narsarsuaq, Greenland initially seemed to support this hypothesis. However, further investigation of the object revealed that the slits inscribed in the disc are disproportionately spaced, and so the object could not in fact function as an accurate compass. Rather it has been suggested that the instrument is instead a “confession disc” used by priests to count the number of confessions in their parish. Similarly, researchers and historians continually debate the use of the sunstone in Viking navigation. Because a sunstone is able to polarize light, it is a plausible method for determining direction. By showing which direction light waves are oscillating, the sunstone has the potential to show the sun's position even when the sun is obscured by clouds. The stone changes to a certain color, based on the direction of the waves, but only when the object is held in an area with direct sunlight. Thus, most scholars debate the reliability and the plausibility of using a navigational tool that can only determine direction in such limited conditions. Viking sagas routinely tell of voyages where Vikings suffered from being "hafvilla" (bewildered)—voyages beset by fog or bad weather, where they completely lost their sense of direction. This description suggests they did not use a sunstone when the sun was obscured. Moreover, the fact that this same bewilderment could arise when the winds died suggests that the Vikings relied on prevailing winds to navigate, as expected if their skills depended principally on traditional knowledge. One Viking custom was to bury dead chieftains in their ships. The dead man's body would be carefully prepared and dressed in his best clothes. After this preparation, the body would be transported to the burial-place in a wagon drawn by horses. The man would be placed on his ship, along with many of his most prized possessions. The chieftain's favorite horses, often a faithful hunting-dog and occasionally thralls and households, were sacrificially killed and also buried with the deceased. The Vikings firmly believed that the dead man would then sail to the after-life. An example of a Viking ship burial was excavated near the Danish village of Ladby and can be found on display here. The preserved remains of the Oseberg Ship, now located in the Viking Ship Museum (Oslo). 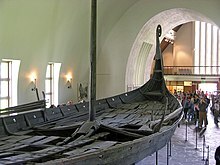 Burial of ships is an ancient tradition in Scandinavia, stretching back to at least the Nordic Iron Age, as evidenced by the Hjortspring boat (400–300 BC) or the Nydam boats (200–450 AD), for example. Ships and bodies of water have held a major spiritual importance in the Norse cultures since at least the Nordic Bronze Age. The remains of Skuldelev ship 3 in the Viking Ship Museum (Roskilde). ^ Plural of knarr is knerrir. ^ "Fejl: Siden blev ikke fundet / adgang er ikke tilladt". Vikingeskibsmuseet Roskilde. ^ Ervan G. Garrison (1998). History of Engineering and Technology: Artful Methods. CRC Press. p. 111. ISBN 978-0-8493-9810-0. ^ Stephen Batchelor (30 April 2010). Medieval History For Dummies. John Wiley & Sons. p. 101. ISBN 978-0-470-66460-5. ^ Oscar Noel and Sue Ann Bowling (21 March 1988). "Polar Navigation and the Sky Compass: Article #865". Alaska Science Forum. Retrieved 24 November 2010. ^ Hafvilla: A Note on Norse Navigation, G. J. Marcus, Speculum, Vol. 30, No. 4 (Oct., 1955), pp. 601–05, Published by: Medieval Academy of America, https://www.jstor.org/stable/2849616 (accessed November 2, 2011). 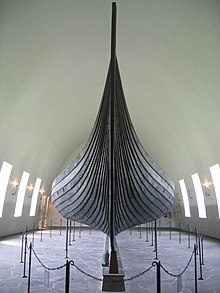 Wikimedia Commons has media related to Viking ships. This page was last edited on 9 April 2019, at 19:19 (UTC).